The corps of Officers of Middleport #363, who recently claimed the traveling gavel of the 18 lodges of the 12th Masonic district. MIDDLEPORT — Middleport Masonic Lodge No. 363 in Middleport, Ohio, will have its annual inspection on Friday, Jan. 18. Dinner will be served at 6 p.m. and the inspection will begin at 7 p.m. The annual inspection provides a special opportunity for the members of the Middleport Masonic Lodge to renew friendships with Masons from around the area. 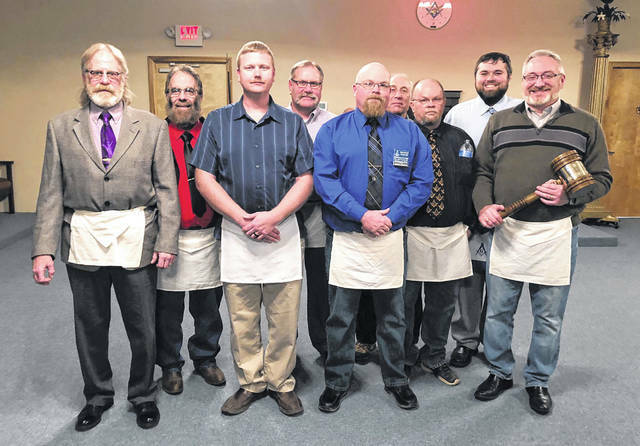 The Lodge is part of the 12th Masonic District, which includes Meigs, Gallia, Jackson and Lawrence Counties. The Grand Lodge was formed at the Old Statehouse in Chillicothe on January 3, 4, 7 and 8, 1808. The Middleport Lodge #363 has 104 members and is involved in various ways within the community. All Master Masons in the area are encouraged to attend the inspection, though dinner reservations are appreciated. For more information or to place a reservation, call Guy Bing at (740) 416-0601 or visit www.freemason.com.